Soothing to the nervous system, restorative yoga has proven profoundly beneficial to adults with developmental disabilities. The relaxing yoga class taught by Jasmine fosters body awareness, deepens self-awareness and provides an safe and nurturing environment for the YAI residents living in housing at The Landmark in Port Washington. Our teacher Jasmine, has a brother with disabilities and this experience helps her understand this community's unique needs and how to tailor her Yoga class to serve them in the best way possible. This Karma Project is sponsored by lululemon athletica, Manhasset as a part of the Here To Be Program. 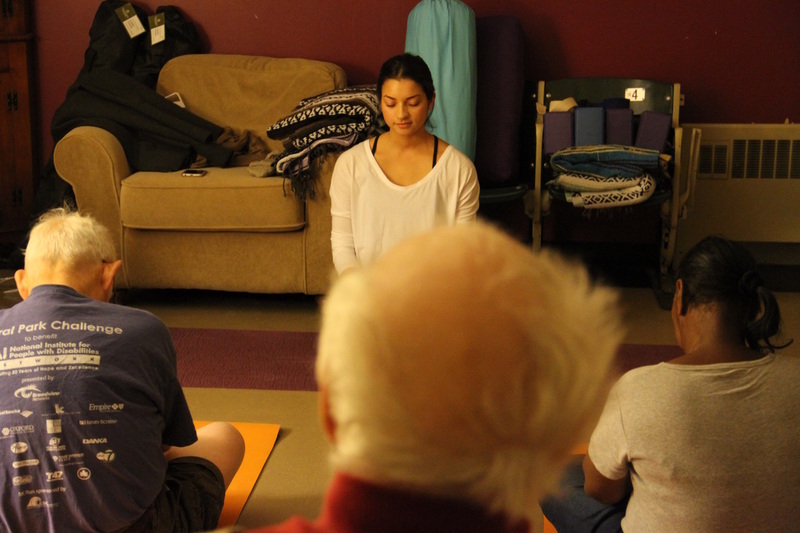 The team at the Manhasset store wanted to help make the practice of Yoga and Meditation available to the disabled adults in our community, as well as support their team member Jasmine in her passion to provide practice to the disabled community. ​Unlocking the potential within, opening our hearts, and freeing ourselves from anything that does not serve us has been Jasmine’s mission through teaching yoga and meditation. Having always been a truth seeker, Jasmine discovered that the truth to our questions come from a simple place within. Being able to connect with her purpose in life, release stress, and realign her goals has inspired her to motivate others to do the same. Beginning to meditate at age 10, she has been aware of the mind’s power and how breath can help control our thoughts, emotions, and behaviors. Jasmine began her yoga journey in New York, where she has lived her whole life until two years ago when she moved to San Diego, California to pursue her yoga teacher training certification. She is currently back on Long Island attending graduate school for Mental Health Counseling. YAI helps children and adults achieve the fullest life possible by creating new opportunities for living, loving, working and learning. Founded in 1957, YAI’s comprehensive services now support thousands of people every day. YAI offers residential programs, employment training and support, day services, opportunities for recreation and socialization, and a variety of services that support and empower families. YAI/National Institute for People with Disabilities provides a wide range of services to people with disabilities and their families in the Bronx, Brooklyn, Long Island, Manhattan, Queens, Staten Island and Westchester County.